Since its inception in 2007, SoftMouse has gone through many iterations and improvements based on client feedback and the growing needs of the mouse research community and associated compliance requirements. With the deployment of SoftMouse v1 in 2008, the web has changed a lot. Design styles have evolved, web browsers have gone through many iterations, the widespread adoption of tablet devices and smart phones has brought about a whole new medium from which end users access the internet. Read through the below to get a full history of SoftMouse's evolution over the years! A very simple database aimed at replacing the error prone spreadsheets that were primarily in use in laboratories to track colony data. 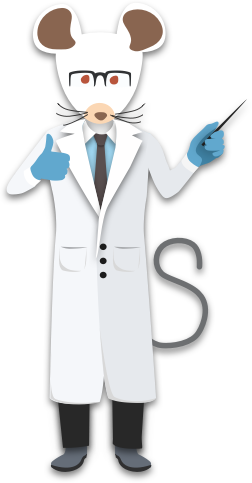 The ultimate goal was to provide laboratories with an easy to use, web alternative to allowing for more streamlined colony data and better cost management. As the web matures and becomes more sophisticated, so has SoftMouse. As many of our clients have experienced first hand in submitting feedback how SoftMouse has been enhanced with new features over the past few years since SoftMouse v2 first came out in 2011. With all of the updates that have been made, subtle differences became apparent between the older and newer parts of the database. Incorporating the feedback we received since the release of v1, SoftMouse v2 was a vast improvement over its predecessor, in both configurability as well as new features. 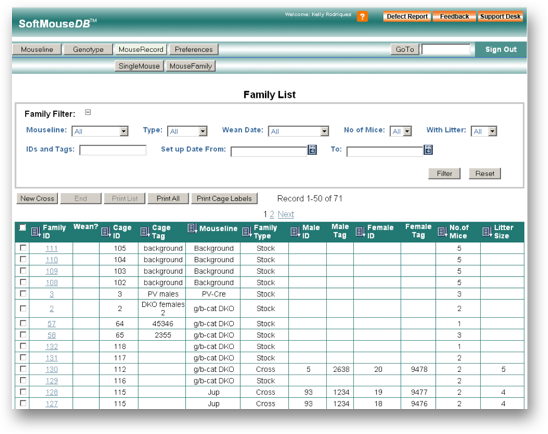 User customized drop down lists, new data sharing features, a full experiment tracking module allowed for SoftMouse to move from a simple spreadsheet replacement to a powerful research tool. Over the past few months, the Iseehear development team has been working on the SoftMouse v3 project to enhance the look and feel of SoftMouse with a more modern and consistent design, layout, style, behavior and page performance. While the look of SoftMouse will be new, please rest assured that we have kept the main layout and navigation consistent with the database that you already are familiar with. A fully traceable breeding colony database where colony and study data are centralized and transparently available to all stakeholders involved. 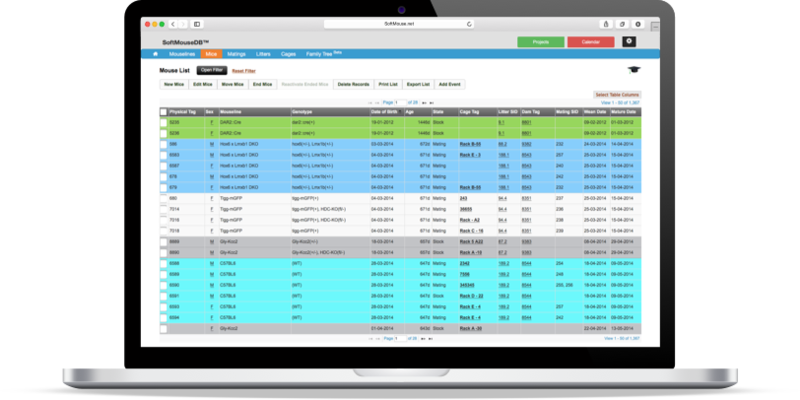 Workflows are automated and standardized on one centralized system offering labs complete control over their colonies and studies in order to make timely decisions. Calendar and task management : Calendar representation of important date and time sensitive information (e.g. wean dates, plug dates, surgery dates, breeding dates, etc. ), with email alerts. With the new SoftMouse v3, we have also optimized SoftMouse for easier display on smaller screen devices. 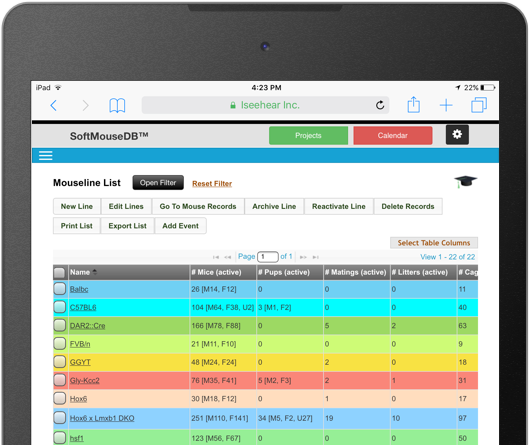 If you are taking your smartphone or tablet into the facility, you can access your SoftMouse account with the new simplified mobile interface for quicker data entry. Simply go to www.softmouse.net and the system will auto detect your screen size to ensure it shows you to corresponding interface. 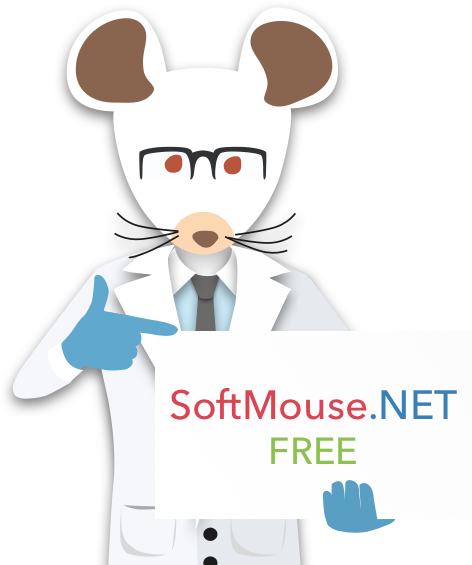 SoftMouse FOREVER FREE Cloud is a limited functionality version of the SoftMouse PREMIUM Single User account and can be used at no cost for an unlimited period of time. SoftMouse FOREVER FREE users are accorded the same standards of security, encryption and IP protection that our paid subscribers receive. Over the past few months, the Iseehear development team has been working on the SoftMouse v4 project to enhance not only the look and feel of SoftMouse with a more modern and consistent design, but more importantly, the page performance through upgrades to the SoftMouse engine. 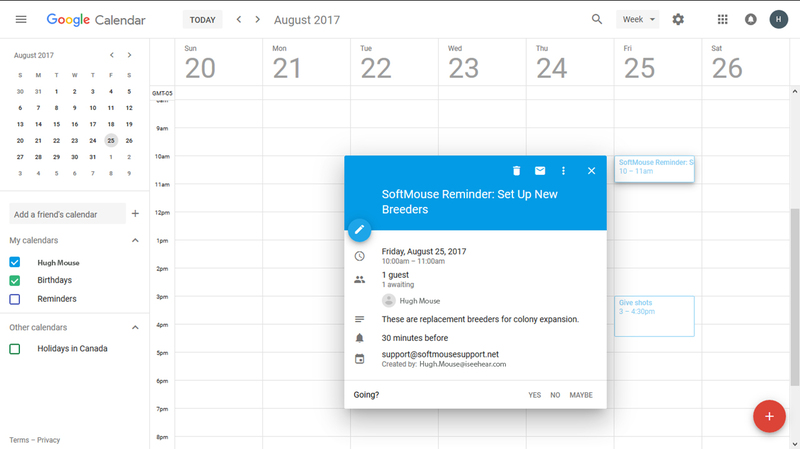 Staying on top of experiments and deadlines is now easier with new calendar features in SoftMouse. Calendar syncing: Sync your SoftMouse calendar to your work calendar (e.g. Google Calendar, Outlook, iCal). Event history table showing on edit pages: When adding colony records to your calendar events, you now have a full history of the events on the Edit page for the record in question, allowing you to see a full history of all key events associated with the record. Tail/Tag check box on Litter Edit page now linked to calendar with strikethrough on the event: When marking a Tail Tag date as completed by checking the box on the associated Edit Litter page, the associated Tail/Tag date in your calendar now shows a strikethrough indicating that the task was completed. 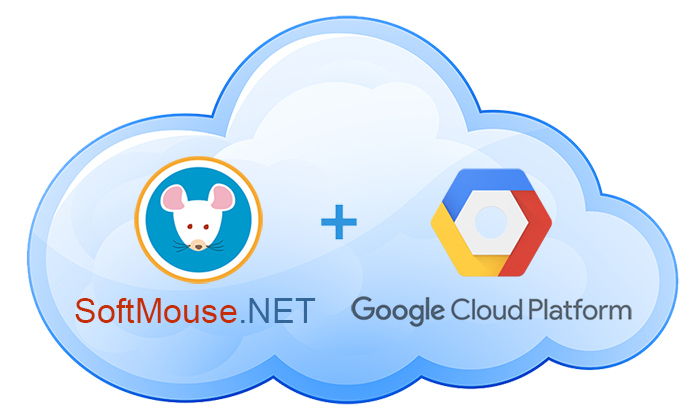 The SoftMouseCloud v2 has migrated away from our first clouds at NTT America and IBM Cloud to the Google Cloud Platform. 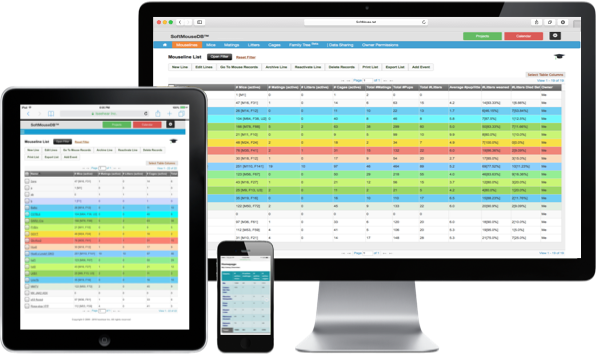 The SoftMouseCloud v2 upgrade enables us to integrate with new technologies and SoftMouse.NET CMS features to better assist you with managing your research, vivarium, breeding and mouse/rat colonies. The SoftMouse Team has also been busy with improvements and new features to enable easier usability and faster inputting of data. To learn more about the recent and past upgrades please log into your SoftMouse.NET account and click on the Home icon on the menu to read the full details.